At the Melanoma Center, we frequently get asked what melanoma looks like. We wish there was a simple answer – if there was, it would be much easier to identify melanoma and provide prompt treatment. Instead, we provide patients with guidelines for identifying suspicious growths, which may be melanoma or another skin cancer. If you’re concerned about any growth on your skin, make an appointment with your dermatologist immediately. One of the first signs of melanoma is a change in an existing mole. The mole may grow larger, change in shape or color, or develop a different texture. Any change, whether sudden or gradual, may indicate skin cancer. 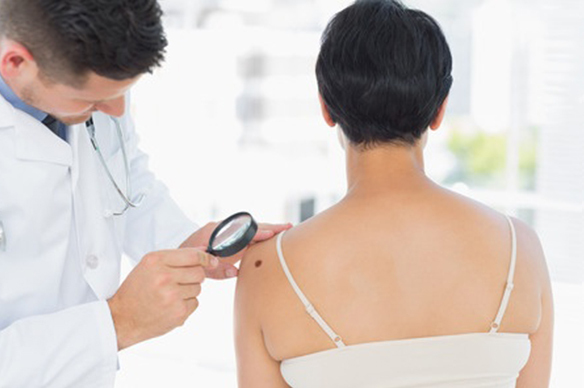 Melanoma can also appear in an area where a mole has not previously existed. Asymmetry – If one half of the mole does not match the other, the mole is asymmetrical. Border irregularity – The edge of the mole is not clearly defined and may be blurred, ragged, or notched. The pigment (coloring of the mole) may appear to spread into surrounding skin. Color that is uneven – Multiples colors are present. Melanoma can be just about any color, including black, tan, brown, white, gray, red, blue, or pink. Diameter – While most melanomas are larger than ¼ inch, some can be quite small. Take note of any lesion that is changing in size. Evolving – Any change in the mole or lesion over the past weeks or months is cause for concern. Another way to detect potential melanoma lesions is to use the "ugly duckling" concept. Researchers have established that the majority of moles on a person resemble each other. If there is a mole that is noticeably different from surrounding moles, then it should be examined by a doctor so that melanoma can be diagnosed or ruled out. If you have an "ugly duckling" mole or a mole that has an ABCDE feature, you should make an appointment to see one of the doctors at Melanoma Center immediately. When melanoma is suspected, one of our doctors meets with the patient to examine the suspicious lesion. The doctor will try to learn as much as possible about the growth of the lesion and will ask you to provide details on how it has changed and when you first noticed these changes. The doctor will also ask if you have experienced other symptoms and go through the details of your medical history to determine if you have an increased risk of developing melanoma. Our doctors typically use dermatoscopy, a technique that involves the use of a special magnifying glass, to see the lesion more clearly. If the doctor believes the lesion is cancerous, a biopsy will be ordered. This is the only way to diagnose or rule out melanoma. There are a number of different ways to perform biopsies on suspicious lesions, including shave biopsy, tangential biopsy, incisional biopsy, and excisional biopsy. Our doctor will determine which one is most appropriate based on the patient’s symptoms and the lesion’s growth. If melanoma is diagnosed, additional tests will be required to determine whether the cancer has spread to other parts of the body.